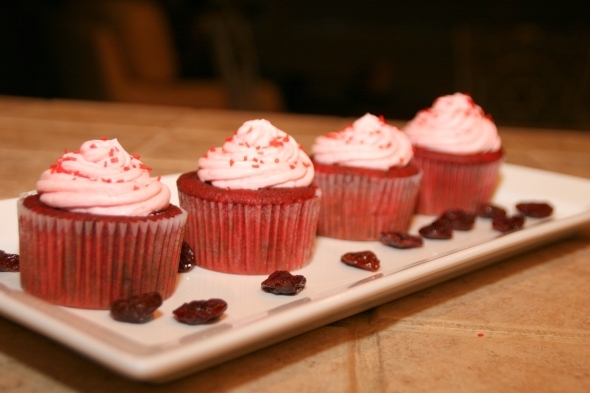 Simple, delightful and delicious is how I would best describe these red velvet cupcakes. Simple white moist cake with a hint of chocolate, delightfully red in color, deliciously frosted with a light and fluffy pink frosting, a dramatic color combination for a real treat! Preheat oven to 350 degrees with rack in the center. Line a 12-cup muffin pan with cupcake liners. Lightly spray top of pan with non-stick cooking spray to prevent tops from sticking. Sift flour, cocoa powder and salt in a medium bowl, set aside. In the bowl of an electric stand mixer fit with the paddle attachment beat the butter until soft. Add the sugar and beat until light and fluffy (about 2-3 minutes). Add the egg and beat until well incorporated. Scrape down the sides of the bowl if needed. Add vanilla and beat until combined. Reduce speed to low and add buttermilk and flour mixture alternately, beginning and ending with the flour mixture, mixing batter until smooth. Add food coloring and mix until well incorporated. Batter should be deep red in color (slowly add additional food coloring in small amounts if needed). In a small mixing bowl, combine baking soda and vinegar, allow the mixture to fizz then quickly fold into the batter. Using a ¼ measuring cup evenly distribute cupcake batter inside cupcake holders. Smooth tops then bake in the oven until a toothpick inserted into the center of the cupcakes comes out clean, about 18 minutes. Remove from oven and allow cupcakes to cool, about 10 minutes. Transfer to wire rack to cool completely. Fill a piping bag with frosting and frost the cupcakes starting from the outside and working your way in the center. Sprinkle tops with red sparkling sugar. *Cupcakes keep well in an airtight container for up to 3 days.